Security in all of its forms is vital for businesses. It’s not just cyber security that should be a concern, but also physically securing your business premises with business security systems. We’ve discussed cyber security a lot in the past and it’s one of our specialities as we provide protection to all devices in the form of firewalls, password management, anti-virus software, disaster recovery plans, and more. We also monitor all devices in real time to be prepared for any eventuality. However, we’ve now expanded our services beyond cyber security, offering new premises security services to secure your business premises with modern and sophisticated technology. Personal data is not always stolen through cyber attacks, you can also lose data the old fashioned way through physical theft of devices. Computer hardware is the lifeblood of any business and once it’s lost you can say goodbye to profits, productivity, and your customers’ trust until the matter is resolved. The key to preventing this problem is by controlling who has access to your business premises. At ICT Solutions we’re now designing and installing a range of business security systems including access control systems which are a modern way of securing entrances without a key. 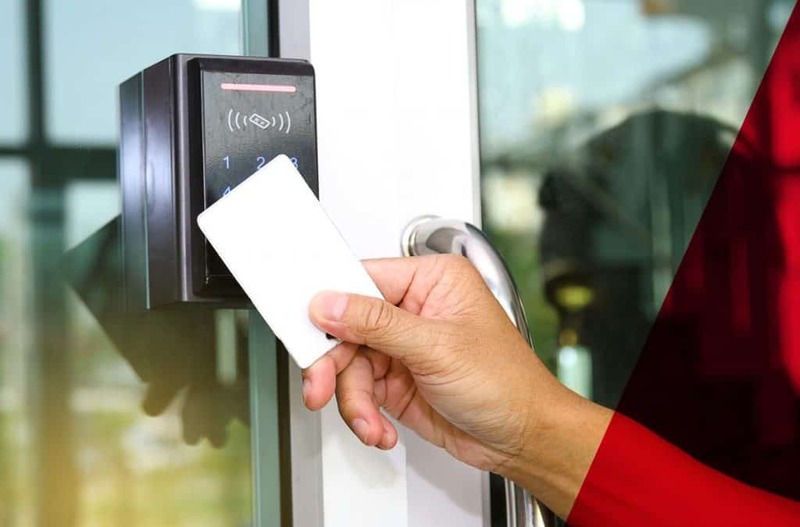 There are three types of access control that we use including RFID (radio frequency identification) fobs, biometric technology using fingerprints, and card readers. Access control systems are a bespoke way of securing your business and they make gaining access easier for your staff and those who are trusted to enter the building, but harder for criminals. Tracking and reporting is also available with our access control service so you’re always aware of who’s entering the building and when. Surveillance has been around for years and is a necessity in any business premise. Nothing beats having physical evidence of theft or breakages and it can work as an effective deterrent. CCTV has evolved to record more clearly and in high definition. ICT Solutions are now installing modern HD CCTV to capture those entering your building in high resolution of up to 1080p. With a mobile internet connection you can also watch this footage live from anywhere, so if you’re always on the go you can still keep track of what’s going on at your building. We also make it easier for you to search a particular date and time using Intelligent Video Analytics which makes this process more efficient. We also install electronic door entry systems to manage and restrict access. These systems can include audio intercoms or an advanced video feed, wireless door entry and touch screen options. Door entry systems do not require keys or fobs as with a simple push of a button you can grant or decline entry. They give your building a professional image and are also a deterrent to criminals. The installation process at ICT Solutions is bespoke and involves firstly surveying the premises to determine how the security system can be incorporated into your existing infrastructure. We then identify and resolve any challenges or complications and design the best security system suited to your business. We aim to install the system without causing disruption to your business and we conduct a post installation survey to ensure that everything is working as it should. Installing a security system is just as important as installing cyber security software so If you would like one of our security systems installed for your business, simply give us a call on 0151 230 2424 to find out more or to book your installation date.